Since Gallup began tracking religiosity at the state level, Washington has been among the least religious in the union. Forty-seven percent of adults in the state say they are not religious, and seldom or never attend services. Ever since pollsters began asking Americans about their faith, Washington has ranked among the less-religious states in the country. But Washington has never been as secular as it is right now. A record number of state residents didn’t identify with any religion in 2017, according to polling giant Gallup. Forty-seven percent of adults in the state say they are not religious, and seldom or never attend services. 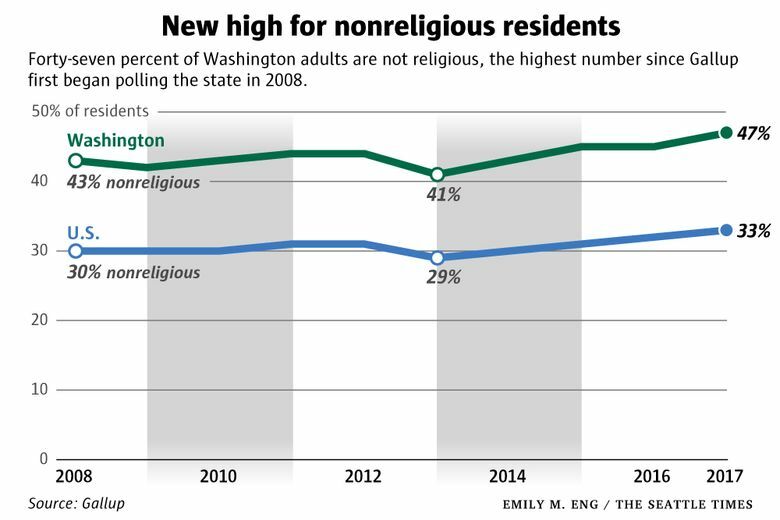 When Gallup began polling about religious belief at the state level in 2008, 43 percent of Washingtonians identified as nonreligious. That number didn’t change much year-to-year, except for a hard-to-explain dip to 41 percent in 2013 (the nation as a whole also saw the percentage of nonreligious drop that year). After that, the number started to rise. That’s true for many other states as well. In fact, the U.S. as a whole is also at a record high, with 33 percent saying they are not religious. It’s primarily young people who are beefing up the numbers of the nonreligious in the U.S. The poll data show that just 28 percent of those younger than 30 are very religious, compared with 47 percent of those aged 65 and older. And it’s possible that the influx of young newcomers to the Seattle area is the driving force behind the change in Washington’s numbers. 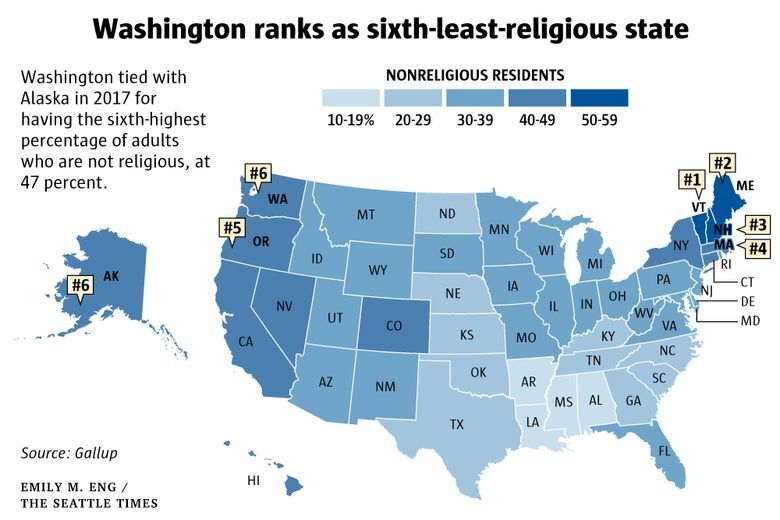 Washington ranks as the sixth-least-religious state, in a tie with Alaska. Oregon has tended to poll just slightly less religious than Washington, and that held true in 2017. 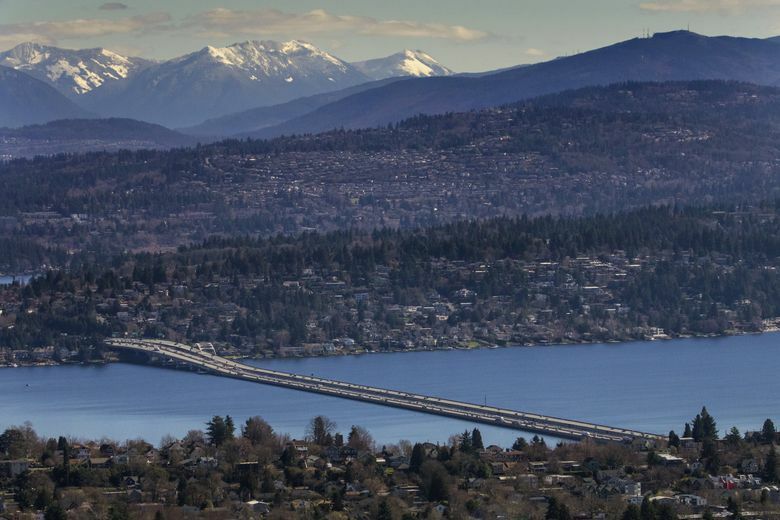 Forty-eight percent in the Beaver State have no religion. Washington is one of 19 states, plus the District of Columbia, where the plurality of adults are nonreligious (as opposed to very religious or moderately religious). Just 28 percent of adults in Washington identify as highly religious, and say they attend services weekly — 19 percentage points lower than those who are nonreligious. In fact, in all the other Western states — Oregon, California, Alaska and Hawaii — the percentage of adults who are not religious also outweighs the percentage who are very religious by double digits. The most- and least-religious states are, perennially, Mississippi and Vermont — and I’m sure you can guess which one is which without me telling you. In 2017, 59 percent of Vermonters had no religion, while only 12 percent of Mississippians did. New England is the least-religious part of the country, claiming the top four states, but the Western U.S. is right behind. The Southern “Bible Belt” states are the most religious, although Utah ranks up there too. It’s one of just four states where the majority of residents identify as highly religious. That make sense because the polling shows that Mormons are the most devout religious group in the U.S., with 73 percent identifying as very religious. They’re followed by Protestants (50 percent), Muslims (45 percent) and Catholics (40 percent). Jews are far and away the least devout group, with just 18 percent saying they’re very religious. In terms of race and ethnicity, blacks are a more likely group to be very religious (48 percent) compared with whites and Hispanics (both at 36 percent). The data comes from Gallup’s daily tracking poll, which is conducted throughout the year. In 2017, about 129,000 U.S. adults were interviewed, including nearly 3,400 in Washington. The margin of error is +/- 2 from 2013 to 2017, and +/- 1 from 2008 to 2012.